Dawson doing what Dawson knows. 2011 Has brought a new set of coaches, new set of standards and a whole new playbook to the shore of the Erie. There was all this speculation of who is going to be the new coach, will McCoy be the real QB (I so hope so) and what to do about our terrible wide receivers. I haven't written an article on here in awhile, I know I'm sorry you couldn't read my ramblings, but every day I have been wondering why the Browns went without resigning Phil Dawson. He is the Browns, he is a fellow dawg in the pound. Phil, yes I feel I am on a first name basis with him, is the only Brown to stick with the team since its rebirth in 1999. 1999! This was before Saddam went down, before Brittany Spears' come back,or before anybody knew the name LeBron (you will lose!). Phil Dawson has been through coaching change after coaching change, he has been with the team since Cribbs was 16. Dawson is, I feel, the best kicker in the league right now. Here is why. Lets be honest, we put him in the worst situations ever. Hey Phil, we are down by 24 and our offense can't score, can you hit a couple field goals and tie this thing up? The sad thing is, he will come damn close. He is the ninth most accurate kicker in the league and that is a gold medal in my book. I cant hit a six-yard field goal with no wind, he his consistent 40+ yard field goals with hurricane winds off of Lake Erie. This past year he went 23 for 28 in field goals. That is 69 points, add that with his 28 point after makes and he has 97 points this year. The Browns themselves, with Dawson, scored 271, so crank my add machine and Dawson scored about 35 percent of the points in 2010-11 season. That is crazy that a kicker can be that kind of offensive machine, he is the most consistent part of the Cleveland Browns. Many rookies and new comers to the teams need the wise man, the one that can sit there and tell you stories of the old times. The one that can help soothe the rookies into a team. It isn't just his on field accomplishments, but just his presence. 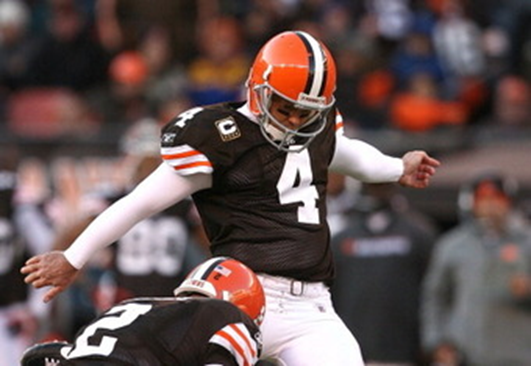 If he was to kick in another uniform every die hard Browns fan would cringe every time our new kicker missed a field goal and say to themselves "WHERE'S DAWSON!" Dawson is the image of the Browns, I want his fathead on my wall next to my Browns banners. He may not have the game winning points in the Super Bowl, but he is one of the most accomplished kickers in history and one of the most accurate in a place that can chew up and spit out kickers easily. The Browns should make it a point to keep Dawson until he retires. With this franchise tag, that wish is very likely coming true and I couldn't be happier.